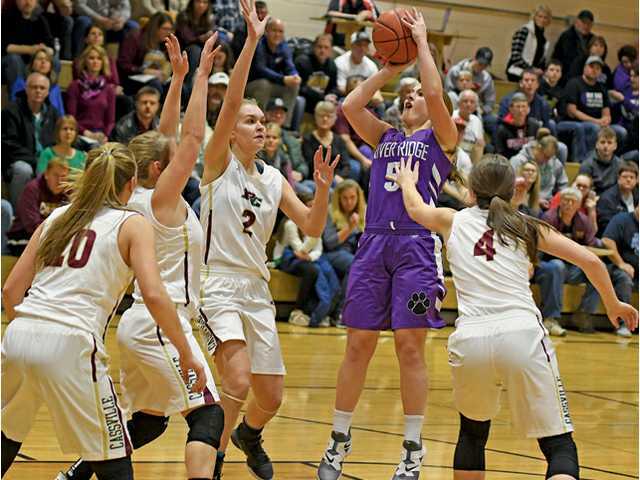 POSTED December 20, 2018 11:45 a.m.
POTOSI – River Ridge junior Skylar White has been on a tear in recent weeks, and last Friday night nearly scored as many points as the entire Potosi/Cassville team in a Six Rivers West girls basketball contest. White, who scored 31 points Friday night, led the visiting Timberwolves to a 64-33 victory over the host Chieftains. White set two new school records eight days earlier by scoring a career-high 32 points in a 92–34 win at Benton, breaking the previous mark of 31 set in 2002 by Stacia Nemitz, and by knocking down eight 3-pointers, bettering the previous mark of six in a game set in 2015 by Roni Zinkle. Friday’s win gives River Ridge a league record of 3–0 and an overall mark of 7-1, while Potosi/Cassville fell to 2-1 in conference action and 4-3 overall with the loss. The Timberwolves held a decisive halftime lead of 32-19 over the Chieftains, getting 16 points from White, and eight from senior Taylor Langmeier, who went 6-for-7 from the free throw line in the first half. River Ridge scored 32 points in the second half, while limiting Potosi/Cassville to just 14. White scored 15 points on her own in the second half, while Langmeier added nine for River Ridge. While White led all scorers with 31 points, Langmeier finished with 17, as the two combined to score 48 of their team’s 64 points. Leading Potosi/Cassville in scoring was Amber Udelhoven, who scored 13 points, 10 of which came in the first half. Lilly Post chipped in eight and Sydney Fecht had five. Last Tuesday night in a non-conference contest, the Timberwolves traveled to Seneca, and came home with a 74-16 victory over the Indians. White finished with a team-high 24 points, while Langmeier had 20. Bayli Mason chipped in eight, while Rylee Zinkle and McKenzie Graf each finished with six. This Thursday night, the Timberwolves (3-0, 7-1) will travel to Shullsburg (2-1, 3-2), and will then be off until Jan. 10, when they travel to Highland. River Ridge - Faith Schier 2, Skylar White 31, Taylor Langmeier 17, Ruby Breuer 6, Glenna Marshall 2, Rylee Zinkle 2, Bayli Mason 3, McKenzie Graf 1. Totals - 20 20-29 64. Potosi/Cassville - Lilly Post 8, Justice Udelhoven 2, Brittany Horner 3, Amber Udelhoven 13, Jessica Noonan 2, Sydney Fecht 5. Totals - 12 6-12 33. 3-point goals - RR: White 3, Langmeier 1; P/C: A. Udelhoven 3. Team fouls - RR 14, P/C 23. Fouled out - Horner (P/C). River Ridge - Faith Schier 2, Skylar White 24, Taylor Langmeier 20, Ruby Breuer 3, Rylee Zinkle 6, Bayli Mason 8, McKenzie Graf 6, Chloe Stagman 5.Totals - 30 5-8 74. Seneca - Savanna Wallin 4Murielle Grover 3Makenna Greene 7Gena Noel 2. Totals - 4 8-10 16. 3-point goals - RR: White 4, Zinkle 2, Graf 2, Stagman 1; S: None. Team fouls - RR 6, S 4. Fouled out - None.